It’s pretty difficult to feel important while reclined beneath an infinite ocean of stars, peering into the depths of the Grand Canyon. 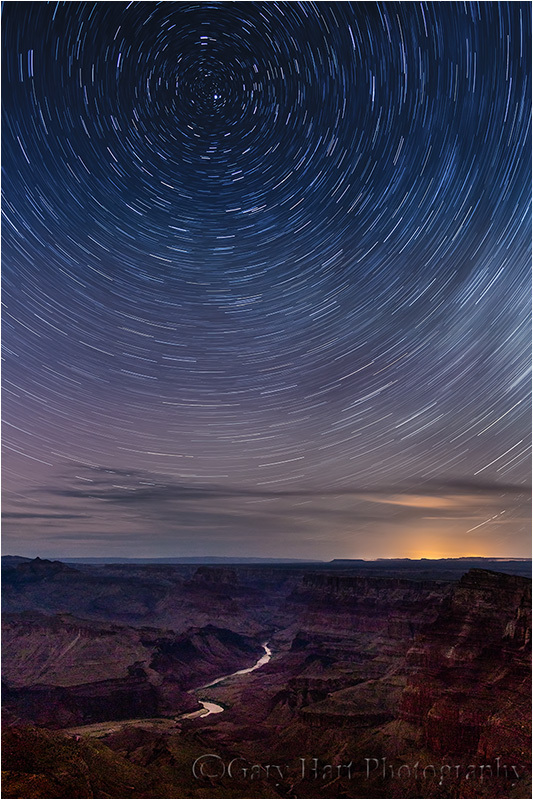 Below you unfolds a cross-section of Earth’s last two billion years, chronological layers of landscape sliced by gravity’s inexorable tug on the Colorado River; overhead is a snapshot of the galaxy’s (perceived) pinwheel about the axis of our planet’s rotation. From our narrow perspective, at any given time, the Universe appears fixed. But observe the night sky for a few hours and you soon realize more is at play. Those points of light overhead all follow the same east to west arc across the celestial sphere, ultimately disappearing beneath the horizon (or behind the glow of daylight). Most return to the same place twenty-four hours later, but a few shift relative to the stellar background. For millennia explaining these wanderers while maintaining our position at the center of the Universe required convoluted solutions that defied scientific scrutiny. Then Copernicus, in one elegantly simple paradigm shift, removed Earth from the center of the universe and set us spinning about the Sun, pouring the foundation for humankind’s understanding of our place in the Universe. The humbling truth is that we inhabit a small planet, orbiting an ordinary star, on the outskirts of an average galaxy. Locked into our terrestrial frame of reference, distracted by the problems of life, we stay generally oblivious to the celestial dance overhead. But I can think of no better way to get some perspective on our place in the universe than to look up on a moonless night, far from city lights. On these nights our planet’s rotation, too slow to be perceived at any given instant, is captured beautifully by a fixed, Earth-bound camera that rotates with us, blending multiple, sequential instants into a single frame. This long exposure stretches each star, a discrete point to our eye, into continuous arc of light, the length of which is determined by the duration of the shutter’s opening—one degree of arc for every four minutes of exposure. From our perspective the northern sky appears to circle the north celestial pole (occupied by Polaris). Images that include celestial north are etched with concentric arcs—if there were some way to continue the exposure for twenty-four hours (say in the dead of winter at the North Pole), our image would show Polaris like a brilliant gem ringed by full, perfectly symmetrical circles. To a camera centered on the celestial equator (the halfway point between the north and south axes of rotation), a long exposure reveals divergent arc, with the stars north of the celestial equator bending around the north celestial pole and stars south of the celestial equator bending the other direction, around the south celestial pole. The above image was captured during my 2012 monsoon trip to the Grand Canyon. Don Smith and I had spent the day chasing (and dodging) lightning, but because we didn’t feel we’d taken enough risks, we thought it might be a good idea to stumble about with the mountain lions, in pitch dark, on the rim of a one mile deep chasm. While photographing late afternoon and sunset from Desert View, we scouted potential starlight locations in daylight, and returned to the car to eat sandwiches and wait for darkness. And dark it was. Dark enough that I couldn’t really see the canyon’s edge, which was about two feet from my tripod. Waiting for our exposures to complete, Don and I just kicked back and admired the night sky. We saw several meteors cut the black, and several satellites drift by. The city of Page, sixty-five miles north, was a faint glow to our eyes (but much brighter to the camera). Sporadic lightning flashes illuminated clouds to the northwest, well beyond the North Rim and probably as far away as Utah. And the Milky Way, the community of billions of gravitationally connected stars to which our Sun belongs, spread from horizon to horizon.